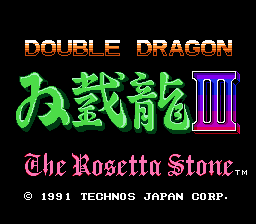 This is the translated version of the Japanese version of Double Dragon 3. 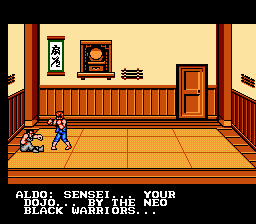 The English version altered the plot of the game during the translation process, as the Japanese version (titled Double Dragon III: The Rosetta Stone) features a script that's much closer to the arcade game. Whereas the English version involves another rescue mission to save Marion, there's no mention of her in the Japanese script and the Lee brothers are simply searching for the stones in order to become the world's strongest fighters (the final boss is a resurrected Cleopatra instead of Queen Noiram). 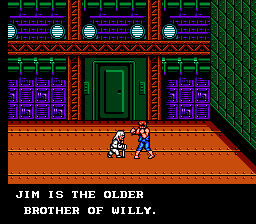 Additionally, the death of Brett (whose name was Aldo in the Japanese version) was not connected to the search for the stones, but rather the culprit turns out to be Jim, the boss of the first stage, who is revealed to be the brother of Willy from the original Double Dragon (a subplot that was eliminated in the English version). Additionally, the difficulty is slightly different between the two versions. In the Japanese version, the player starts each stage with more health for their characters and there are less enemies to fight. 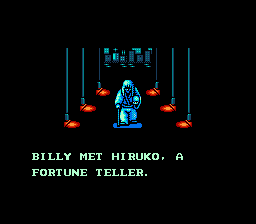 However, the ending of the Japanese version differs depending on which of the player characters are still alive by the end of the game, whereas the English version always shows the complete ending with all four protagonists no matter what. This translation was requested by DanielKay. Enjoy!